Last night, a bomb exploded outside of a Wisconsin Planned Parenthood, injuring no one and doing a small amount of property damage. The 90's are back, you guys! According to Green Bay's WGBA-26, the clinic in Grand Chute was damaged last night by a small blast from a homemade bomb that had been placed on a windowsill. No one was injured and police are investigating the blast. What, exactly, was whoever placed the bomb on the windowsill trying to accomplish? The clinic that was damaged offers abortion services, emergency contraception, and LGBT services, but it isn't open on weekends, and the windowsill bomber, possibly upset that the sills weren't currently being used to cool one of Planned Parenthood's famous Plan B(lueberry) Pies, didn't stick around to make sure his DIY bomb worked, or that it did any damage. Mild inconvenience accomplished, but abortion still exists, as it has since female humans have had the capacity to realize that they don't always want to be pregnant. 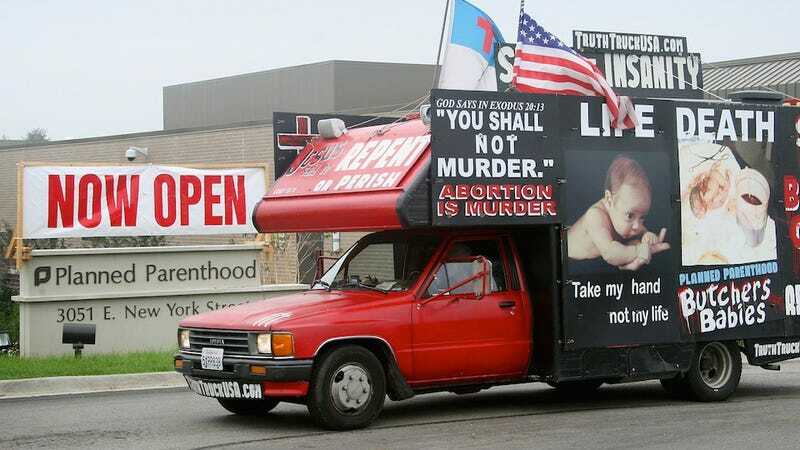 While abortion clinic attacks have become less nutjob-trendy in recent years, they've by no means gone away. In January, 41-year-old Bobby Joe Rogers firebombed a family planning clinic in Pensacola, Florida, claiming he was driven to do so because of his anti-abortion beliefs. The clinic his Molotov cocktail gutted had previously been the site of the murder of two abortion doctors in 1994. And in 2009, a mentally ill man rammed an SUV into the front of a Planned Parenthood clinic in St. Paul, Minnesota. It's not clear whether the bomb was specifically intended to hurt people or just assembled so an adult baby with a loud noises fetish could destroy something. But at any rate, it's time for Planned Parenthood to reset the big DAYS SINCE SOME PSYCHO TRIED TO BOMB US board back down to 1.